In the first case, a man in his 20s creates a concoction of toilet bowl cleaner, shampoo and other household chemicals to produce a hopefully fatally toxic gas. Last year, the Exit Euthanasia Blog warned that the logic in using these things is fatally flawed. The chemical compositions of such materials are either unknown, or liable to change without warning, or both. We don’t shy away from the method. We’re not trying to sell you a helium tank or an ‘exit hood.’ We’re just pointing out stuff based on science and our own researches rather than the pseudoscience and wishful thinking of underground forums. The man got wrong. Without enough sulfur, the mixture that should have killed him in seconds wasn’t working. He called 911 to save himself. He survived, but what the newspaper reports don’t yet say is what his health will be in the future. The long-term effects of hydrogen sulfide exposure can be unpleasant, including damage to the heart in serious cases, neuropsychological problems, and long-term damage to the olfactory system. The man’s mother was also left with the cleanup bill, totalling several thousand dollars. Clean-up crews initially refused to contain the toxic waste because the woman’s credit card was almost maxed out. 36 hours later, another man mixed some chemicals up to kill himself and succeeded. But his mother, who tried to save him, was almost killed by the fumes. Both she a a state trooper needed emergency medical treatment. 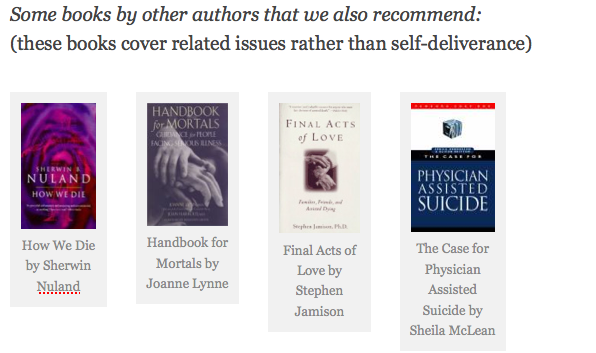 Exit’s books and member’s journal detail research into methods of suicide, supported by medical evidence. This entry was posted in self deliverance and tagged failed suicide, hydrogen sulfide, hydrogen sulphide. Bookmark the permalink.